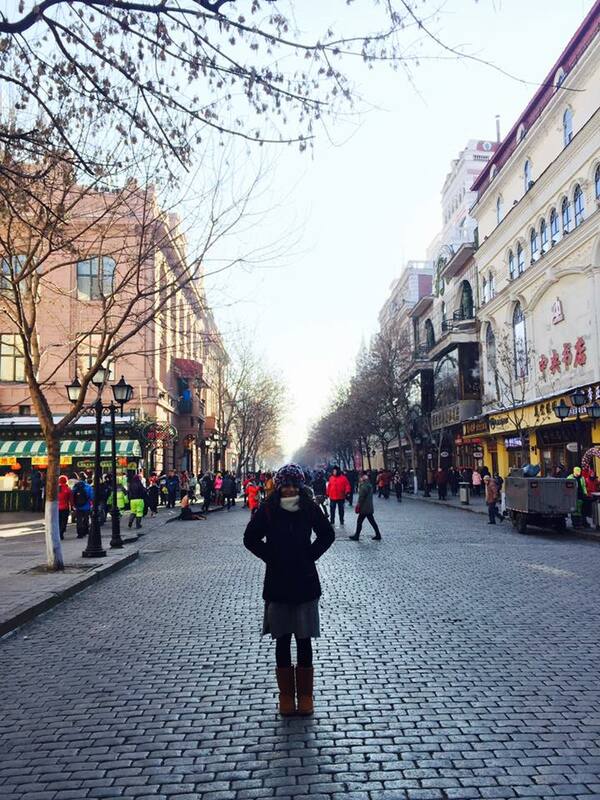 Ahhh… it gives me a happy shiver to reflect upon my trip to Harbin last December. I’m from England where yes, it’s cold; but it’s not ridiculously, crazy or freezing cold. So, what I’m trying to say is this was my first experience of real COLD temperatures. The temperature during our stay varied from -10 degrees Celsius to -22 degrees Celsius! No exaggeration there at all. 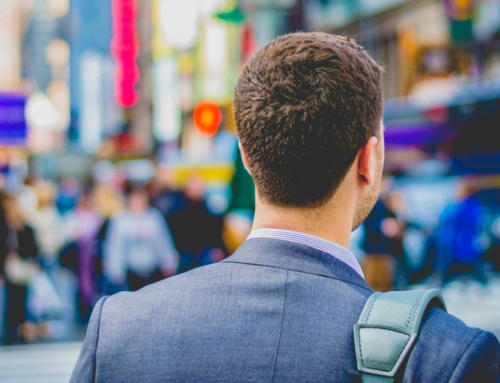 The temperature difference was the first thing I noticed when I exited the airport, with my friend Matt who had joined me from Wuhan, and looked for a taxi. My hands immediately tingled with coldness and it was sort of like a huge, icy, breath of fresh air! Anyway, as my hands and face numbed we quickly found a taxi to take us to our hotel. WORD OF ADVICE: Negotiate the price of the taxi before you go to your destination. Harbin taxis can be extortionate because they know people can get desperate due to the cold temperatures. 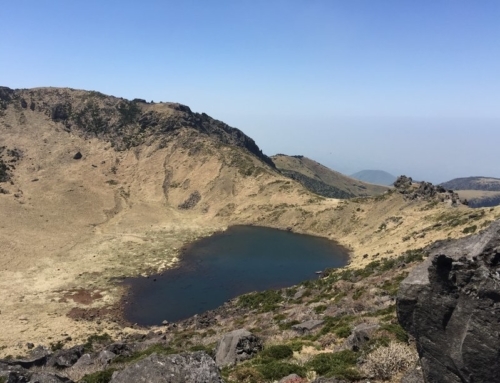 Anyway, for around about 7km we definitely overpaid, I think we paid around 260rmb which was way too much. We got back pretty late, so pretty much collapsed to sleep; the hotel was pretty decent. We stayed at Yakelai Holiday Hotel, 20 Guogeli Avenue (Dajie). It was a great location and vibrant street. 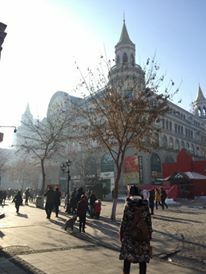 The next day was our first day in the beautiful, winter wonderland that was Harbin. We got up and made the most of the inclusive breakfast at the hotel. After this, all wrapped up in many layers and warm boots, we caught the conveniently located bus from outside our hotel to the city. WOW was my first impression. It was a completely different, surreal part of China to me. To be honest, it didn’t feel like the China I was used to at all. This was the best part of the whole trip to be honest, being somewhere completely different. 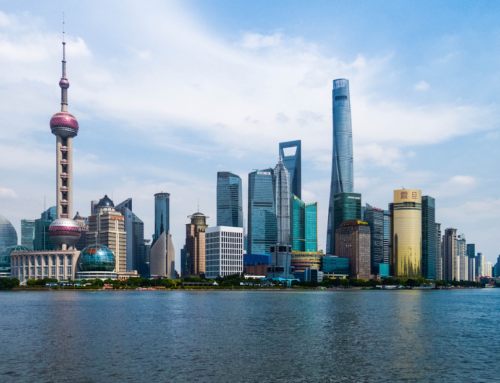 I’ve said it quite often, because it really is true, that China is so vast, diverse, beautiful and varied. You could travel here for a lifetime and not figure it all out. Harbin is located in the North-Eastern region of the People’s Republic of China. 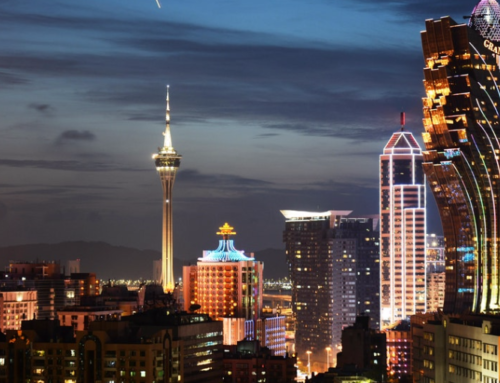 Harbin grew from a small, rural settlement on the Songhua River to being one of the biggest cities in Northeast China. The city’s prosperity was encouraged by an influx of Russian immigrants and the introduction of the Chinese Eastern Railway, which extended the Trans-Siberian Railway. Russia chose Harbin as its base for administration over its railway and also during the Russo-Japanese War, Russia used Harbin as its military base. 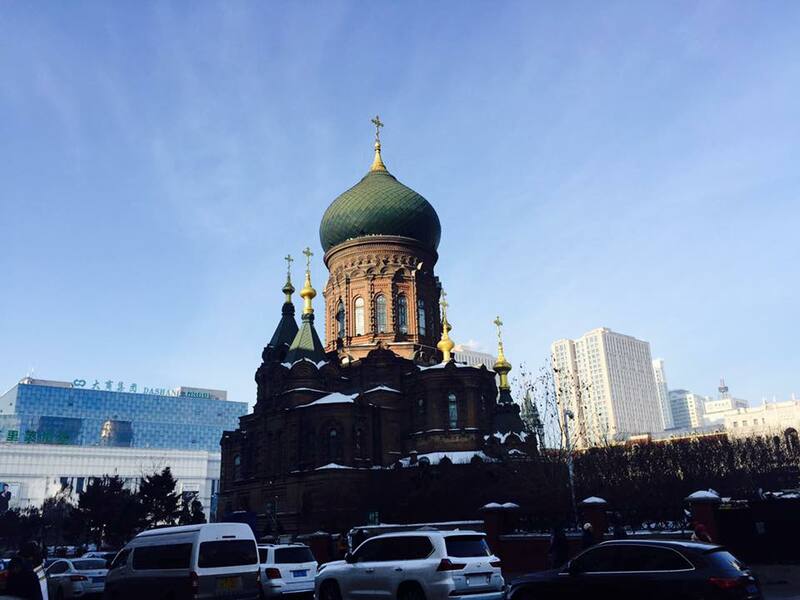 Thus, due to its history and geographical location; the Russian feel is paramount in Harbin. Many Chinese men wear the furry Russian style hats, there is lots of Russian architecture and products imported. 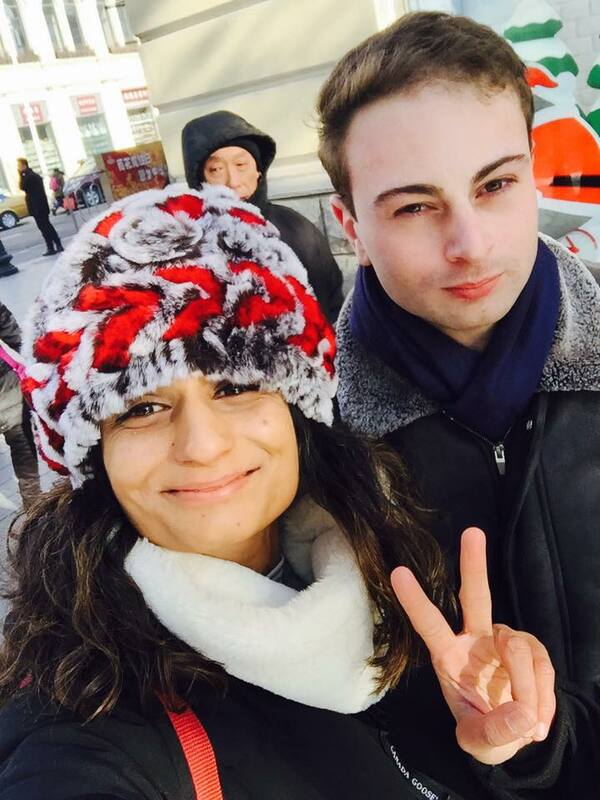 So, we wandered around the city, along the cobbled streets where there were people selling lots of crazy, cute and warm hats, scarves and earmuffs at every corner. Along the way, we immediately saw awesome ice sculptures in the street and in the process of creation. We looked in awe! The hotel breakfast had worn off now and we were beginning to feel hungry for lunch. We stopped for a Chinese version of Nandos called Bandos which was such a warm, cosy, christmassy and beautifully decorated restaurant. After a nice lunch, we passed a tourist office where we got some directions to the Zhaolin Park and bus routes to some nice areas for exploring and food. In addition to the Russian feel you can appreciate in Harbin, Harbin is known as the Ice City and the Ice Sculpture festival in the Winter. The Harbin International Ice and Snow Sculpture Festival began in 1963 and has grown to become the largest in the world. Artists from all over the world come and display their cool creations throughout the city. We came to Harbin just a few days before this Ice Sculpture Festival was set to begin in Harbin. On the streets and everywhere so many intricate, awesome and frosty sculptures were being built. At Zhaolin Park, we couldn’t enter but could watch from outside such amazing sculptures and lights being put up ready. It was remarkable! The most amazing part takes place across the river on another small island, called Sun Island, which Matt and I visited the next day! So, from outside the park we caught the bus to the Old Quarter which the tourist office recommended for food and exploring the old Russian architecture. It was nice to venture and explore a bit further out in Harbin. 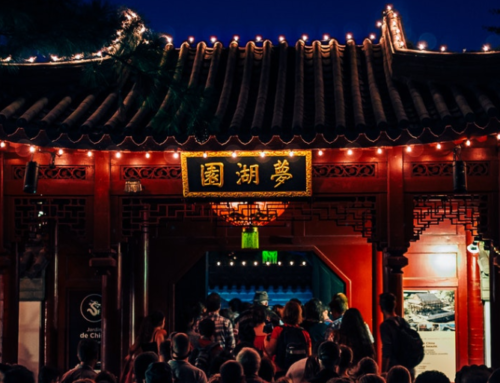 We wandered and were immediately welcomed with street food stalls offering us various Harbin delicacies and Chinese lanterns above us. Walking along the streets there were lots of interesting statues, old historical, Chinese and Russian buildings and tonnes of choice for food! 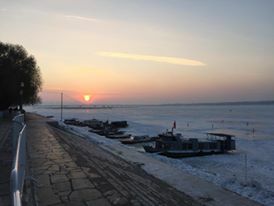 It was a beautiful area, but unfortunately, we were still full from the Bandos; so, after this we decided to head back towards the icy Songhua River for sunset. Sunset was simply stunning. We got there just in time to see the buzz of the river, people skating, sledging and having fun. The sky was pink with a beautiful, round, orange sun setting. Simply perfect! After enjoying the sunset, and a lovely first day in Harbin we took a wander to find somewhere to eat and have a Harbin beer! We found a cosy place, had some lovely Chinese dishes and a hot pot! It had been a lovely day, full stomached we headed back to the hotel for some rest. After resting we had a few drinks local to where the hotel was, on Guogeli Avenue. This street, of the hotel, is a popular, vibrant and lively street filled with restaurants and some bars. I had quite an early night that night as I was knackered by the end of the day and ready to cosy up in bed! So, the next morning I was up and out for 9:30am. I took the same bus as the day before to the centre. 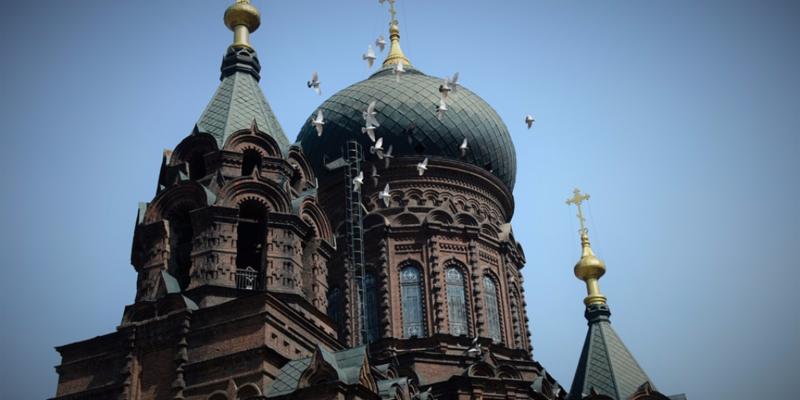 I again admired the Saint Sophia Cathedral that glows in the middle of the city square in Harbin. Close by to there I stopped for breakfast. I remember having strawberry waffles and a coffee (not very Chinese I know but we’re all allowed a cheat day!). Over breakfast I planned my day. 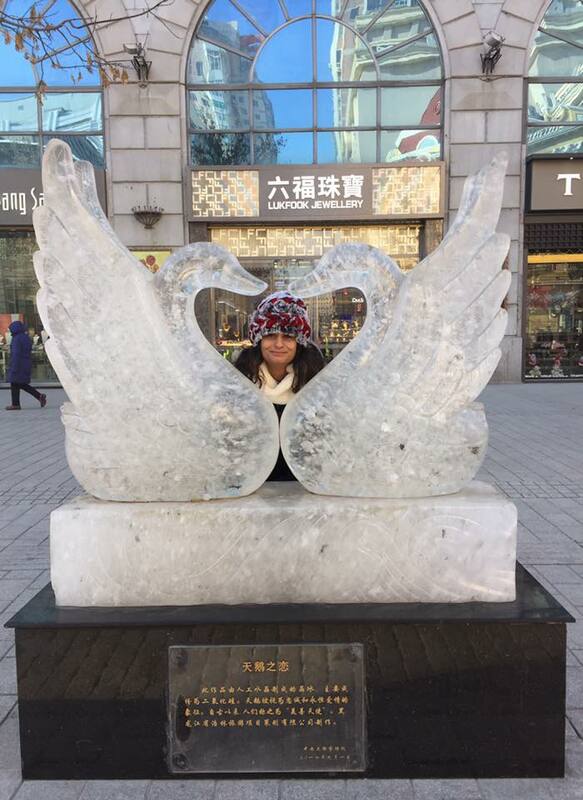 I planned to take a casual stroll around the centre and then head to the frozen, Songhua River for some fun and to potentially cross over to the other side for some exploration and fun of the Ice Sculpture Park on Sun Island. As I walked along the lovely cobbled streets I stopped to buy a beautiful Russian hat and some cute hand-painted Russian dolls. As I gradually explored and walked towards the river, I passed a cute Russian café and took a mental note that I’d go there for breakfast the next morning. I also stopped for a famous Harbin smoked red lean sausage meat on a stick! It was so tasty! So, I arrived to the river and it was bustling with fun! By this time, Matt had arrived to join me and we decided to have a beautiful husky dog short ride around the frozen river which was nice. 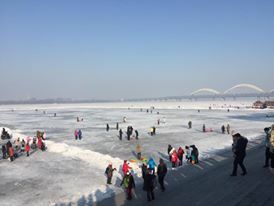 As we enjoyed our surroundings, with people skating, sledging and all sorts, we gradually walked across the frozen Songhua River completely! It was exciting as we got to the other side we weren’t completely sure what to expect there! Upon arrival to the other side, we were immediately offered to take a small, tiny little car thing to Sun Island for the Ice Sculpture Park! The festival wasn’t for a few days, but lots of ice sculptures had been finished and it was a unique experience to see the process of setting it up, and people creating their ice sculptures. Lights were being put up, sculptures touched up on and it was a really exciting atmosphere! Matt and I wandered around appreciating all the creative, beautiful and extremely impressive works of art. The island was also beautiful with lots of natural trees and blossoms growing. We had a nice explore and heading back to cross the river in perfect timing for another sunset! I had another chilled evening because the cold weather and early mornings had me knackered by the evening! The next day was my last day, but luckily my flight wasn’t until the evening so I still had a whole, another day to explore. That morning, as intended, I went to the cute Russian café I saw off Zhongyang Pedestrian street. It was such a cultural, historical, cosy and intriguing experience. 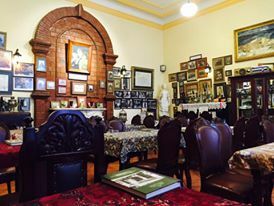 The café’s vibe was exquisite; with its old furniture, Chinese and Russian ornaments, old pictures, antique furniture and a fireplace. The food menu was also great. I opted for Russian bread, with jam and butter as I was there for breakfast. It was delicious, the best bread ever! Especially since I live in Shanghai where the bread (unless you pay more) isn’t so great. In fact, on my way to the café I saw the infamous queue of people for the fresh Harbin bread early in the morning! So, after breakfast I decided to head to the bus stop and take a bus to the museum area of Harbin. At this point I was content with my trip to Harbin so decided to just casually explore and also find a nice chilled café to do some lesson planning, writing and various other work for the week! Before settling in a cute and cosy café, I went to the Harbin Museum. The Museum, to be honest, wasn’t that great but it was nice anyway since it was free. After this, I went to sit down in a cosy nearby café for a while to do some work, lesson planning for the next day (as I’ve opted for a long Thursday-Sunday trip to Harbin due to my fortunate Friday’s off) and studying Chinese. 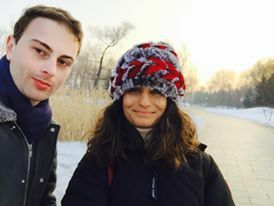 I remember feeling so content at that time having explored another amazing, completely unique city in China and now excited to get back to my home; Shanghai. After a productive two hours or so, I headed to search for somewhere for my last meal in Harbin before heading to the airport. I found a Korean style restaurant and had a scrumptious meal of rice, chicken, vegetables – it was nice! After this I headed back towards the hotel, which was about a half an hour walking distance away. I would definitely recommend to download MAPS.ME. It has worked in every country I’ve been so far and gets you to places, without any data or wifi needed (if you pre-download the map). So, I arrived back to the hotel ready to collect my already packed bags I’d left with the hotel lobby storage. I opted for the bus to the airport rather than taxi, because I was in no rush and I quite like travelling via bus. So, I took a short taxi ride from the hotel to the AVIATION BUILDING – which is where the airport shuttle bus leaves from. I found it pretty easily and was quickly on the way to the airport. I arrived pretty early, which was fine as I had my laptop to entertain me. I’d pre-downloaded some episodes of Eastender’s to watch (yes, I still watch Eastenders after two years away from England). 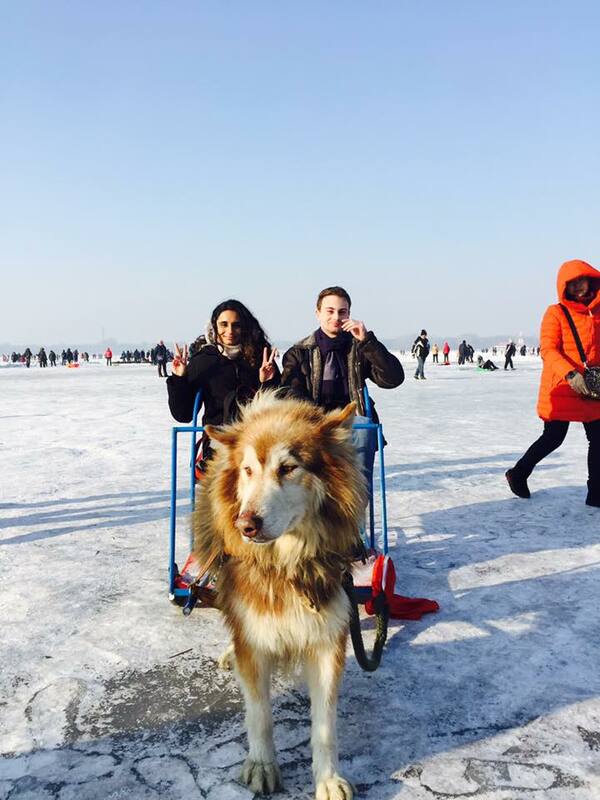 My long weekend trip to Harbin had been memorable, fun and amazing. The highlight for me was the intricate blend between Russia and China. I’d not visited a place like this yet. It was truly beautiful to see a such a different Chinese city. Not only this, but I’d never visited a place with such a cold climate. It was a winter wonderland, it was also amazing to go during the build-up to Christmas and the Ice Sculpture festival! If you like skiing, ice-skating, snow, fun, art, architecture, good food, amazing atmosphere, interesting history and the most scrumptious bread – HARBIN is for YOU!